120 min. Gramercy Pictures. Director: Tim Robbins. Cast: Susan Sarandon, Sean Penn, Raymond J. Barry, Lois Smith, Roberta Maxwell, Robert Prosky, R. Lee Ermey, Celia Weston, Scott Wilson, Margo Martindale, Larry Pine, Clancy Brown, Peter Sarsgaard, Jack Black. 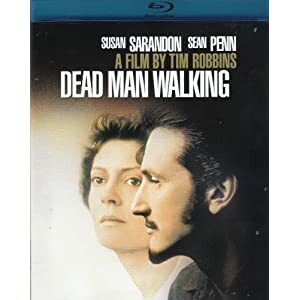 Writer-director Tim Robbins' 2005 drama Dead Man Walking has the distinction of including not one, but two of the greatest screen performances of all time. Susan Sarandon won the Best Actress Oscar for her work as Sister Helen Prejean C.S.J. (author of the non-fiction book on which the film was based), but Sean Penn was shamefully passed over for his towering performance as death row innmate Matthew Poncelet (Nicolas Cage won instead, for Leaving Las Vegas). Though Penn had already made his mark on screen in numerous films, his work for Robbins—and opposite Sarandon—stands up to the most memorable performances of his hero Robert De Niro. The sheer power of these performances threatens to eclipse the considerable accomplishments of the film they serve (indeed, the film shockingly failed to get a Best Picture nomination). 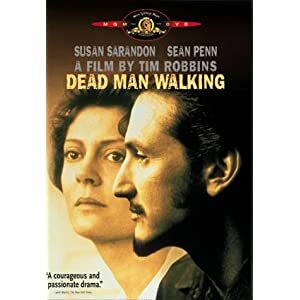 Dead Man Walking excels as the definitive screen consideration of capital punishment and a unique and unforgettable love story. Regardless of one's politics or spiritual beliefs, one must acknowledge that Robbins has given voice to both sides of the thorny political issue and that he has shown the best of what religion can accomplish when it lives up to its potential as a conduit of compassion. As portrayed by Sarandon, Prejean courageously works past her own prejudices to find in herself a bottomless compassion: unlike the cold and cynical prison chaplain around whom she must navigate, Sister Helen struggles and succeeds in modeling her actions on those biblically ascribed to Christ. Where Prejean's book describes her experiences counseling two different death-row inmates in 1980s Louisiana, Robbins' film necessarily consolidates the action by making Poncelet a composite character. With some reluctance, Sister Helen (a Roman Catholic nun belonging to the Sisters of Saint Joseph of Medaille) responds to a letter from Poncelet, visiting him and hearing his request for help in obtaining legal aid. Poncelet rattles her by spewing racist and sexist invective, but Helen's instruction to Matthew that "every person deserves respect" also explains why she persists in helping him. Helen lines up a lawyer (Robert Prosky's Hilton Barber) for Poncelet's last-ditch effort to win a life sentence, but she remains on the line when Matthew makes a request she cannot refuse, to be his spiritual adviser in the rapidly passing days and hours until the scheduled execution. Helen's new project instantly proves unpopular with many, from Chaplain Farley (Scott Wilson) to Helen's own mother (Lois Smith) to Earl Delacroix (Raymond J. Barry) and the Percys (R. Lee Ermey and Celia Weston), the parents of Poncelet's two teenage victims (Peter Sarsgaard and Missy Yager). Helen is taken aback by the realization that she has offended the parents (Earl, a Catholic, asks her, "How can you spend all your time worrying about Poncelet and not think that maybe we needed you too?"). And so she makes an effort to counsel the parents, as well; in the process, the film gives voice to victims' rights and the emotional spectrum found among families, from an unwavering need for revenge (seen in the Percys) to Earl's seemingly insurmountable struggle to "turn the other cheek," as per his savior's biblical directive. Though Robbins' anti-death penalty sympathies are unambiguous, he shows a genuine interest in the thoughts of those who stand opposed to his belief, as well as an empathy for their feelings. The journalistic tapestry of perspectives extends to a guard on the "strap-down team" for Poncelet's lethal injection and Poncelet's family, including his distraught mother (Roberta Maxwell) and his three younger brothers (Jack Black, Jon Abrahams and Arthur Bridgers). "I just keep tryin' to figure out what I done wrong," Mrs. Poncelet says, and though the film touches on the role of economic injustice ("Ain't nobody with money on death row," Matthew accurately observes), Robbins steadfastly locates the narrative suspense as much on the question of Matthew's ability to accept responsibility for his actions (by confessing to Helen) as on the question of whether or not he will receive a legal reprieve. On both counts, the film's second hour becomes increasingly tense. This commitment to the subject matter extends to brilliant production design (by Richard Hoover) and Louisiana location work that add immeasurably to the film's authenticity, while the pitch-perfect photography comes courtesy of the great Roger Deakins. Dead Man Walking makes some of the best use of close-ups I can think of, adding an extra layer of ironic truth to Poncelet's smarmy taunt to Helen: "We got intimacy right now, don't we, Sister?" In their virtuosic pas de deux, the doe-eyed Sarandon and the pompadoured Penn consistently carry the truth of their characters in their eyes. Though the film makes time for some gallows humor, it is undeniably one of the most gut-churning emotional experiences of 1990s cinema and a triumph of mainstream storytelling: there's not an ounce of fat on this flawless, primal drama. In its Blu-ray debut from MGM, Dead Man Walking looks better than it has since its theatrical debut over fifteen years ago, with A/V specs that lift it head and shoulders above the previous, disappointing standard-def DVD issues. The natural-looking image holds the right amount of film grain, and the nicely detailed image only ever seems challenged during the fleeting nighttime sequences; color and contrast are accurate. The lossless DTS-HD Master Audio 5.1 mix also serves the film well, clearly prioritizing dialogue but also nicely spreading the music (including songs by Bruce Springsteen, Eddie Vedder and Nusrat Fateh Ali Khan) and sound effects among the channels for subtle immersion. The prime extra here is the commentary by director Tim Robbins, in which he discusses the true story, his friendship with Sister Helen, the work of the actors, the locations, and the film's politics and themes; it's an essential listen. Also present is the film's "Theatrical Trailer" (2:23, HD). Enthusiasts of the film have reason enough for an upgrade here on A/V specs alone, and those who haven't yet purchased this future classic shouldn't hesitate to do so. All site content © 2000-2019 Peter Canavese. Page generated at 04/18/2019 07:57:22PM.